30 hours of exploring the fungi kingdom through lectures and hands on learning. Silvan Fey is a graphic designer, mushroom educator, community leader & Fungi Academy co-founder. He learned professional cultivation of gourmet, medicinal and entheogenic mushrooms in the village of the famous curandera Maria Sabina in the Oaxacan mountains of Mexico. His connection to mushroom cultivation and fungiculture started in 2013 and it has been a fulfilling journey ever since. To save your spot, please pay a deposit of $200 US to puntamona@hotmail.com with PayPal. Please bring the remaining amount with you in cash. Students will be housed in shared co-ed accommodations for the entire program. We have availability for couples to come and have a private room, we also have a few private cabins, which are available for an additional cost. Private cabins can house two people and are good for a couple or a small family. Please inquire about availability. Facilities are shared by all living at Punta Mona. We have 3 showers with solar hot water and dry-composting toilets in three locations. Most classes are hosted in our outdoor classroom, in the living room of our main lodge or in the Yoga Shala. We recommend you bring your own yoga mat and blanket as it cools down on rainy nights. 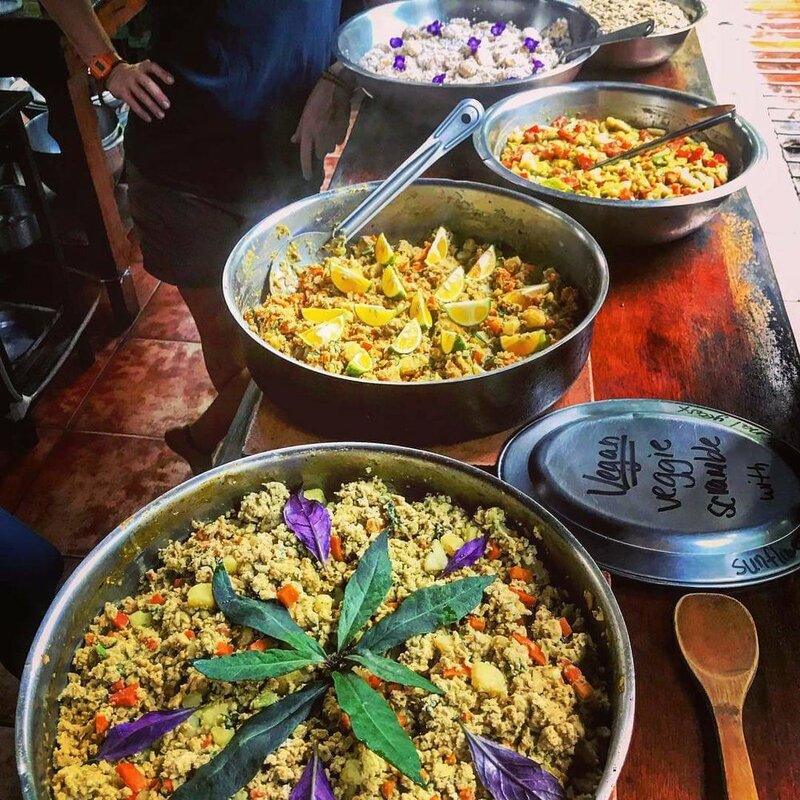 Meals are communal and prepared fresh daily from fruits and vegetables grown organically on site or purchased from an organic farms in Costa Rica. At Punta Mona we are dedicated to wholesome, organic meals prepared with love. We consider the cuisine to be “jungle gourmet” and have a trained and seasoned staff to make sure all meals are mind blowing. We serve vegetarian meals and can accommodate vegan and gluten free diets. We will serve farm fresh eggs daily and occasional local cheeses and free-range chicken from a neighbor’s farm. Fresh line caught fish is also available when we go fishing. We are an off-the-grid farm and all energy usage must be fully respected. We ask if you can charge your devices during the day-time only, sun-dependent. We have internet available during specified breaks and encourage you to disconnect to reconnect. Located in the deep tropics, on the beach, expect bugs, rain, sunshine and humidity. Please follow the packing list that is sent to you upon registering to ensure comfort and a pleasant living experience.